SEOUL, South Korea (AP) — Pentagon boss Jim Mattis arrived in South Korea on Friday to meet with the nation’s top defense officials and American military commanders on the front line in countering North Korea’s nuclear weapons program. Mattis is emphasizing the Trump administration’s push for a diplomatic solution to the problem. But he also has said the U.S. is prepared to take military action if the North does not halt its development of missiles that could strike the entirety of the United States, potentially with a nuclear warhead. Making his second trip as defense secretary to the U.S. ally, Mattis will meet with South Korean officials as part of an annual consultation on defense issues on the Korean peninsula. He’ll be joined in Seoul by the chairman of the U.S. Joint Chiefs of Staff, Gen. Joseph Dunford. President Donald Trump is scheduled to visit the city next month. The US has three aircraft carriers in the Pacific amid soaring tensions with North Korea. The US Navy says the deployment of the USS Nimitz, the third carrier, was previously planned, but the US Navy has been busy near Korea. The US, South Korea, and Japan just wrapped up a missile-defense drill in the region, and North Korea remains quiet for now. The USS Nimitz aircraft carrier and its accompanying strike group of destroyers have left the Middle East, where they had launched airstrikes against ISIS, to back up US forces in the Pacific, the US Navy announced on Wednesday. 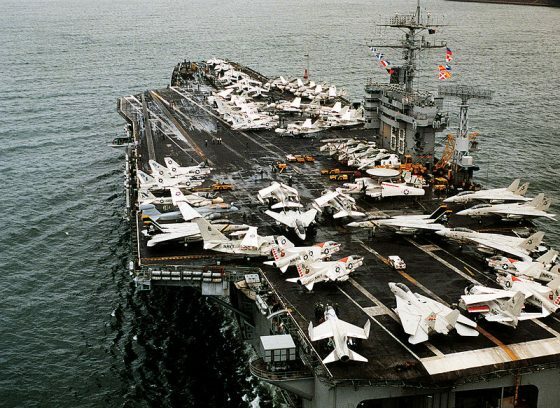 The Navy says the Nimitz is heading to the Pacific on a previously scheduled visit, but it will be the third carrier in the region joining the USS Ronald Reagan, which stays in Japan year-round, and the USS Theodore Roosevelt, which is currently in the Pacific well east of Japan. According to the Navy, the Nimitz just finished three months fighting ISIS, with over 903 bombs dropped. ISIS fighters are now surrendering en masse as US-back ed regional forces close in on them. Gen. Jeong Kyeong-doo, chairman of South Korea’s Joint Chiefs of Staff, and US Forces Korea chief Army Gen. Vincent Brooks met aboard the Reagan after the drills, with Jeong saying that the carrier sent a “strong warning” to North Korea “amid an unprecedentedly grave security situation,” according to Yonhap news. The US, South Korea, and Japan just concluded a missile-defense drill near Korea with their cutting-edge naval-defense platforms. The drill focused on improving situational awarene ss and readiness while North Korea threatens to send more missiles flying over Japan. Despite North Korea’s talk of firing missiles at Guam or into the Pacific, the country remains quiet. Pyongyang hasn’t launched a missile in over a month, marking the longest period of relative quiet since its first missile launch in February. But a recen t report states that North Korea has remained resolute and unwilling to talk to the US. Meanwhile, President Donald Trump seems intent on hinting at the possibility of war whenever possible. A senior North Korean official has issued a stern warning to the world that it should take “literally” his country’s threat to test a nuclear weapon above ground. The official, Ri Yong Pil, told CNN in an exclusive conversation in Pyongyang that the threat made by North Korea’s foreign minister last month should not be dismissed. North Korea “has always brought its words into action,” Ri said, visibly angry. More here.